We're attempting to set up a sub project documentation site, per SIG-docs netlify + hugo is the recommended toolset for this. I think the netlify "site" will have access by one member, the maintainers of kind (@munnerz and I) have created https://github.com/kind-ci-robot as a possible option to jointly manage this. If we went this route, the robot would also need to join kubernetes-sigs. We use the preview feature and auto-deploy feature from Netlify. @BenTheElder I'd be happy to chat f2f if you need more details. EDIT: And in the SIG-Docs call today, though it sounds like there may be follow-up there. I'm currently working on a project for the CNCF that's basically a Hugo/Netlify/Bulma template: https://github.com/cncf/docs-in-a-box. The goal is to have something that you can git clone and go in just a few minutes, including instructions in the template on getting Netlify set up. The template is still mostly a placeholder but I'll be iterating on it in the coming weeks. I'm 100% open to feedback on what that template would need to include to be usable out of the box for Kubernetes SIGs. BTW, you can see what that template currently looks like here: https://docs-in-a-box.netlify.com. Again, still pretty basic but lots of room for growth. I'd like to see it become a living, breathing project with lots of contributors across CNCF projects. Basically I want to do whatever it takes for this to become a "default" solution for Kubernetes SIGs (and other CNCF projects, and even projects outside the CNCF if they so choose). AFAICT you may already have what you need? Can you confirm? I went ahead and approved them. Please let me know if I broke something that was working. For the record I based my decision off of the fact that we already have this setup for kubernetes/website, so prior art wins. can you close this out if you've got what you need? I think this is all we need from k/org for now, but let me confirm -- I think we may also need to either get a site enabled on the netlify end with some help from sig-docs, or see about getting our bot in the org to enable the site against the bot account somehow..
@spiffxp Everything works fine for kubebuilder on Netlify. 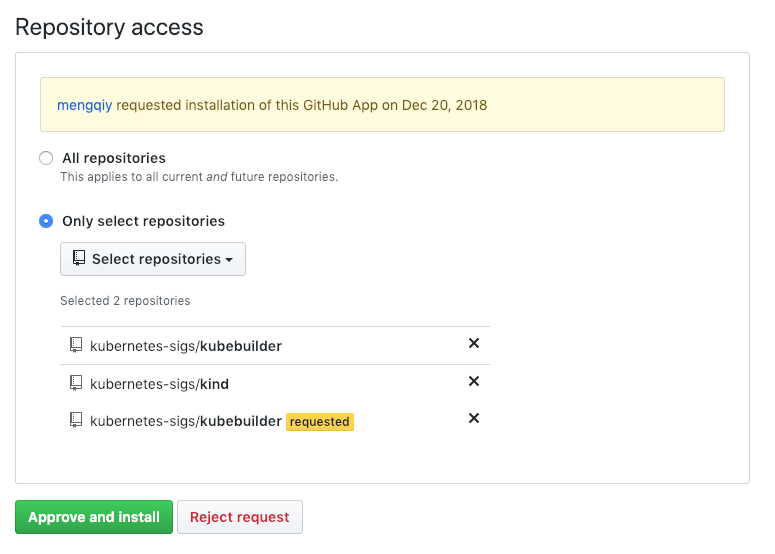 I don't remember why there is a pending request for kubebuilder. Maybe we can get rid of it. 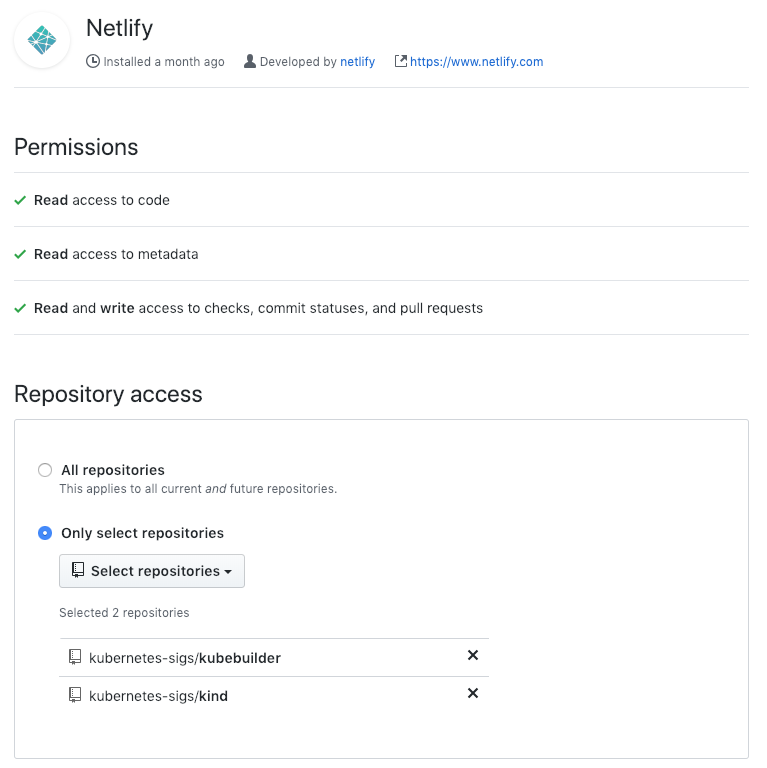 Closing the loop a little: Andrew created a Netlify team under Kubernetes for this, thanks everyone!